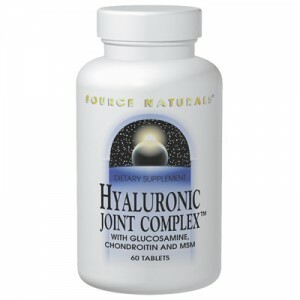 What is Source Naturals Hyaluronic Joint Complex with Glucosamine, Chondroitin, and MSM? Source Naturals Hyaluronic Joint Complex with Glucosamine, Chondroitin, and MSM is a joint supplement from Source Naturals which makes many other supplements. Source Naturals Hyaluronic Joint Complex with Glucosamine, Chondroitin, and MSM has good amounts of the 4/9 ingredients we were looking for. In addition to those 4 it also has Vitamin C and manganese which are also helpful. Source Naturals Hyaluronic Joint Complex does not have any artificial dyes or coloring. Glucosamine Has a 1500mg mixture of glucosamine. Glucosamine is a precursor to glycosaminoglycans which are a major component of joint cartilage. Chondroitin Sulfate Has 1200mg of chondroitin sulfate, more than the average supplement. Chondroitin makes up glycosaminoglycans which are a component of cartilage. Methylsulfonylmethane (MSM) Has 900mg of MSM, more than most other supplements. MSM is a vital source of sulfur for protein and connective tissue synthesis. Hyaluronic Acid Has 200mg hyaluronic acid, much more than other supplements. Hyaluronic acid is a vital fluid found in the synovial (joint-lubricating) fluid. I tried every other MSM products like Instaflex, kirkland Signature brand. Nothing helped me. From a Homoepathic Store I got a recommendation to take “Source Naturals Hyaluronic Joint”. I have been taking it from past 5 weeks and I see really good results. My knees are not making the cracking noise while taking the steps. Just walking it feels really good, previously I use to be very cautious during my walk and feel that the sharp pain might come. I havent had the sharp pain since I have started taking the tables. I HIGHLY recommend this tablet.